"With the Aurora-IC and Aurora-SP, Caelin Gabriel has created interconnects and speaker cables that reach the sonic heights of his power cords." Sound "The Aurora-IC and Aurora-SP exhibit tremendous poise -- neither too much of this nor too little of that.... I don't think these Shunyata cables have no sonic signature; rather, they are so finely balanced that they walk a line between every positive sonic attribute I can identify, ultimately giving them less of an identifiable sound than any cables I've heard." "The Shunyata cables present performers with sharp delineation and copious weight. There's no thin wispiness and exaggerated speed that pass for increased resolution, and no excess warmth that gives the illusion of additional weight." Features "Central to...[the Aurora-IC interconnects and Aurora-SP speaker cables] is Shunyata's patented Helix geometry, which uses multiple counter-rotating conductors that are wound around a polyethylene dielectric and aims at eliminating what Shunyata calls 'self-induced distortions' -- specifically capacitive and inductive reactance." "New to the Aeros-series cables are Shunyata's Cohergenic Conductors" and Alpha Cryogenic Process. "The Aurora-IC interconnects have 12 conductors that create an aggregate 13-gauge cable, while the Aurora-SP speaker cables have 16 conductors for a combined 7-gauge cable." Use "I used the Shunyata interconnects and speaker cables over an extended period of time and with a larger-than-normal assemblage of electronics and speakers. With each combination of equipment and each change in combination, the Shunyata interconnects and speaker cables retained their particular sonic signature, debunking the notion that the sound of audio cables -- at least of these audio cables -- somehow changes and rearranges based on the equipment with which they are used." Value "There's no denying that these are wildly expensive cables, and also no denying that they are at the very top of their respective product categories, even when far more expensive interconnects and speaker cables are considered." In my 2007 review of the Convergent Audio Technology SL1 Ultimate Mk 2 preamp, I relayed a story about something I overheard at CES that year. After I talked with Ken Stevens, the president and chief designer at CAT, in the hallway outside his demo room, two guys passed by. One referred to Ken as "that preamp guy" because of Ken's time-honored SL1 preamp. In this same spirit, Caelin Gabriel of Shunyata Research could be "that power-cord guy." For more than a decade, Gabriel has pushed the boundaries of power-cord design and performance, creating examples that have exhibited consistent high quality and steadily improved on his previous efforts. He followed up his power cords with the Hydra series of power conditioners, which have also gained renown for their audio performance. A natural addition to Shunyata Research's power products are what the company calls its "signal cables" -- interconnects and speaker cables to you and me. There have been three series here, and I've heard interconnects and speaker cables from them all. I've admired certain things about them (the "consistently open, detailed midrange and treble" of the Antares Helix Interconnects and Orion Helix Speaker Cables, for instance), even while I've been cautious about other things (the somewhat lightweight bass of these same cables). So when Shunyata introduced the Aeros-series interconnects and speaker cables, I was expecting a refinement of the earlier cables, not a wholesale change. However, Caelin Gabriel and the gang at Shunyata Research have created "signal cables" that are simply unlike any previous efforts, "that power-cord guy" expanding his sphere of audio influence in important new ways. The new Aurora-IC interconnects ($7500 per meter pair) and Aurora-SP speaker cables ($15,000 per eight-foot pair) are the top of the Aeros line, which also includes two less expensive pairs of matching interconnects and speaker cables. Central to all of them is Shunyata's patented Helix geometry, which uses multiple counter-rotating conductors that are wound around a polyethylene dielectric and aims at eliminating what Shunyata calls "self-induced distortions" -- specifically capacitive and inductive reactance. All audio cables have inherent levels of capacitance and inductance, and they may be largely responsible for the sonic differences we hear among audio cables. With its Helix geometry, Shunyata aims at reducing these to as near zero as possible. Helix does this by using wide separation and 90-degree crossing angles for the conductors, which minimize capacitance. Furthermore, the counter-rotating helices, which are longitudinally offset to create "disparate EFF (electromagnetic flux fields)," minimize inductive reactance. But there is literally a price to be paid for the use of the Helix geometry: All Shunyata Helix cables are braided by a human being to length, which adds to their cost. The Helix geometry is so complex that no machine can re-create it. Thus, these Shunyata cables cost a healthy amount of money because there are no spools of Helix cable from which each length can be pulled. Someone skilled will be weaving the conductors together by hand. New to the Aeros-series cables are Shunyata's Cohergenic Conductors. Earlier Shunyata interconnects and speaker cables used conductors of "certified CDA-101 copper," which is "pure copper" according to the US Department of Energy. Cohergenic Conductors are that and more -- the product of a proprietary process that creates a permanent inter-molecular alignment of the copper molecules within each conductor. As Shunyata explains, during the usual extrusion or casting process of copper wire, the wire progresses from a molten to semi-molten state. As this happens, the molecules are free to move in relation to one another. As the copper cools and hardens (which occurs very rapidly), the molecules are locked into place in a relatively random orientation. In contrast, the molecules of Cohergenic Conductors are locked in electrical alignment permanently. This happens via an electromagnetic field that induces electrical current within the conductor while it is being created. Caelin Gabriel designed the electromagnet used for this process. Earlier Shunyata cables were cryogenically treated, but the new Aeros-series cables take the deep-freeze process a few steps further. First, Gabriel has developed an ideal atmospheric environment for the cryogenic process using a combination of various inert gases. The goal of this is improving upon the effects of conventional nitrogen-based cryogenic treatments. Second, Shunyata Research uses a computer-controlled slow-freezing cycle that takes 72 hours from start to finish. Temperature is lowered in single-degree increments, with a stabilization period before the lowering continues -- down to minus 320 degrees Fahrenheit. Shunyata calls this the Alpha Cryogenic Process, and it's unique to Aeros-series cables. The Aurora-IC interconnects have 12 conductors that create an aggregate 13-gauge cable, while the Aurora-SP speaker cables have 16 conductors for a combined 7-gauge cable. Both are thicker than you're probably used to, and while they are not very stiff, the Helix braid can make twisting the cables to make a connection somewhat unyielding. One change from earlier Shunyata interconnects is easy to see: The Eichmann Bullet Plug RCA connectors are gone, replaced by WBT NextGen RCAs. I've never liked the Eichmann connectors. They were often difficult to push onto RCA jacks, and in the case of a piece of equipment I owned, they scratched the RCAs, causing the gold plating to flake off. The locking NextGen RCA connectors are a vast improvement in my opinion. XLRs are proprietary to Shunyata Research and have oxygen-free-copper contacts and direct gold plating. I used the Shunyata interconnects and speaker cables over an extended period of time and with a larger-than-normal assemblage of electronics and speakers. With each combination of equipment and each slight change in combination, the Shunyata interconnects and speaker cables retained their particular sonic signature, debunking the notion that the sound of audio cables -- at least of these audio cables -- somehow changes and rearranges based on the equipment with which they are used. Furthermore, the Aurora-IC and Aurora-SP worked incredibly well with every electronic component and speaker at my disposal -- no mismatches or missteps were apparent. In a few cases in the past, certain cables have been best suited to certain brands of electronics or products that use certain technologies. Not so with the Shunyata cables, which proved to be as universal as any I've used. Amplifiers included Lamm ML3 Signature and M1.2 Reference monoblocks, Convergent Audio Technology JL3 Signature Mk 2 monoblocks, Zanden Model 9600 monoblocks, Raysonic M100 monoblocks, an Audio Research Reference 110 stereo amp, and a Lindemann 855 stereo amp. Speakers were Wilson Audio MAXX 2s and MAXX 3s, with a pair of Raidho Ayra C3.0s in between. Preamps were an Audio Research Reference 3, a CAT SL1 Legend, a Zanden Model 3000 and an Aurum Acoustics CDP. Digital sources included an Ayre C-5xe universal player, an Esoteric X-01 D2 CD/SACD player, a Zanden Model 2000P/Model 5000S transport/DAC combo, and the Aurum Acoustics CDP, which is a topflight CD player as well as a full-function preamp. A TW-Acustic Raven AC turntable with Graham B-44 Phantom and Tri-Planar Mk VII UII tonearms and Dynavector XV-1s mono and stereo cartridges handled LP playback through Lamm LP2 Deluxe and Audio Research PH7 phono stages, as well as the phono sections of the Aurum Acoustics and CAT preamps. Preamps, phono stages, the turntable and the single-box digital players all rested on a Silent Running Audio Craz 4 Reference equipment rack. The Lamm amps had dedicated pairs of Silent Running Audio products underneath -- Virginia-Class platforms for the Lamm ML3s and Ohio Class XL Plus2 platforms for the M1.2s. The Zanden digital separates rested on Harmonic Resolution Systems M3 isolation bases, which work incredibly well with them. Interconnects and speaker cables for comparison were AudioQuest William E. Low Signature and Crystal Cable Dreamline. A Shunyata Research Hydra V-Ray and a number of Shunyata Anaconda and Python power cords -- both Alpha and Vx versions -- handled power duties, trading time with an Essential Sound Products Essence Reference power distributor and a number of Essence Reference power cords. I also used Zanden's own interconnects, speaker cables and power cords with the company's electronics. Phono cables were an AudioQuest LeoPard used with the Graham tonearm and the Cardas-sourced cable that's integral to the Tri-Planar tonearm. 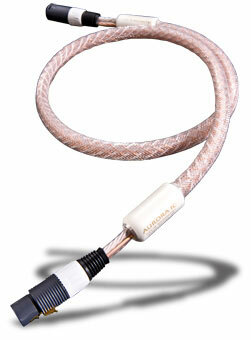 Perhaps because of the thickness of the resulting cable, Shunyata Research doesn't make an Aurora phono cable. That's too bad. Given what I heard from the interconnects, I would have loved to hear an Aurora phono cable. Finally, Shunyata put time on the cables sent to me for review, and to this I added about 100 hours of use. After this, the sound I describe below appeared. Thus, I can't say how much time you should put on new Aurora-ICs and Aurora-SPs, but I can say that you'll definitely want to use them for a while before making any sonic judgments. More than with any other category of audio products, interconnects and speaker cables exist under a cloud of preconception: the notion that their function and performance must adhere to certain preordained principles. The idea here is that interconnects and speaker cables should be unerring conduits between electronics and speakers, not possessing any actual "sound" of their own. The rationale is that wire ("mere wire" in some peoples' minds) only exists to connect vital parts of an audio system -- the parts that ultimately produce the sound -- so it should be sonically invisible. If only things were this simple! In reality, interconnects and speaker cables do have a sound of their own, one that's the product of many things, including the "distortions" that Shunyata feels are indicative of a cable's performance. And this mindset pays dividends, because the Aurora-IC and Aurora-SP exhibit tremendous poise -- neither too much of this nor too little of that. Of course, this makes it difficult to determine what "this" and "that" are, but doing so is possible, especially in comparison to other audio cables. I don't think these Shunyata cables have no sonic signature; rather, they are so finely balanced that they walk a line between every positive sonic attribute I can identify, ultimately giving them less of an identifiable sound than any cables I've heard. Take imaging, for instance, which is a function of not only the ability to cast a voluminous soundstage but also the way images are carved out -- their unique combination of outline and bodily presence. The Shunyata cables present performers with sharp delineation and copious weight. There's no thin wispiness and exaggerated speed that pass for increased resolution, and no excess warmth that gives the illusion of additional weight. Instead, there are things like Hope Waits' beautiful voice on her eponymous debut album (Radarproof RPR1019). It's captured with just enough of everything -- breath, chest, throat and sinuses. Of course, if it's not on the recording, the Shunyata cables won't reproduce it. They didn't conjure fullness for the lean and somewhat brittle sound of the RVG remastered CD of Eric Dolphy's avant-garde statement Out to Lunch (Blue Note 98793) or a light airiness for Greg Brown's great Further In (Red House Records 88). Further In is a warm, somewhat dark recording by nature, and you will know that via the Shunyata cables, which portray it as it is, neither adding nor subtracting anything. This kind of honesty -- real honesty, not the spare, emaciated sound that so many audiophiles think is honest -- is respectful to both the recording and the music. I praised the "open, detailed midrange and treble" of the Shunyata Antares Helix interconnects and Orion Helix speaker cables I reviewed in late 2005, and while I don't hear anything to make me say that these things don't apply to the new cables, I also don't consider them actual earmarks of the sound produced. More important is the fact that the "controversial area" of those earlier Shunyata cables' performance, the bass, is also no longer an issue. In the case of the Antares Helix interconnects and Orion Helix speaker cables, their lowest frequencies were light, lacking in some of the heft that gives music its physicality. I can't speculate with any certainty why this occurred, but it's a moot point with the new cables, whose low frequencies mirror their performance elsewhere: evenhanded and balanced. I've always thought that certain interconnects and speaker cables with inline networks had especially good bass, but the Aurora-IC and Aurora-SP give them a run for their money, not because there is added prominence, for instance, but because there isn't. The low frequencies on some of my bass-workout CDs, like "3000 Miles" from Tracy Chapman's Where You Live (Elektra 83803-2) and "Joe Slam and the Spaceship" from Harry Connick's She (Columbia CK 64376), had real power that was well integrated into the music, not a separate "event." And it is this integration, along with the inherent balance it signals, that defines the Aurora-IC and Aurora-SP -- for good and bad. As I sit here and listen to "Real Love" from Lucinda Williams' latest CD, Little Honey (Lost Highway 001143401), the instruments are edgy, even harsh, and the recording is congealed and confused. No silk purse from a sow's ear this time. On the other hand, "Nice Cars" from Linda Thompson's Versatile Heart (Rounder 613217) sounds spacious, sweet and energetic -- great sound for a great recording. This is what you'll get from the Shunyata Research cables: just what the music and equipment have to offer. 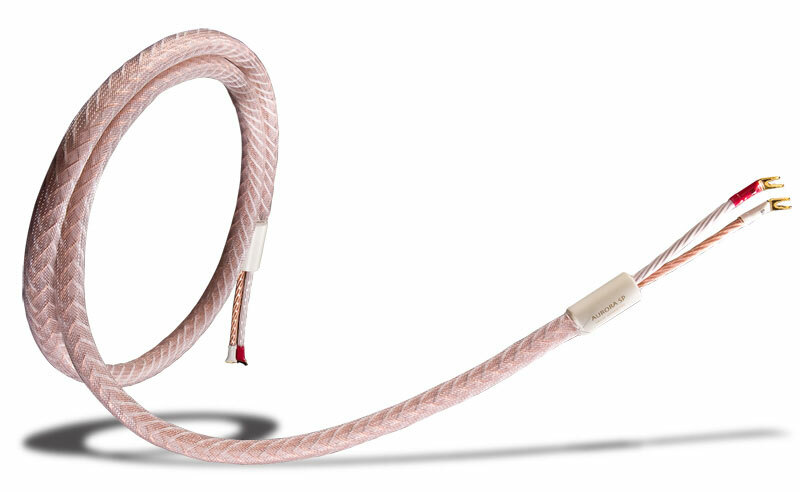 With its William E. Low Signature interconnects ($6200 per meter pair) and speaker cables ($14,500 per eight-foot pair), AudioQuest also addresses distortion in audio cables, specifically with its Perfect-Surface Silver conductors, which boast of reduced distortion between strands and the grain boundaries of each conductor, and its five-level Noise Dissipation System, which uses a combination of different shielding methods to reduce radio-frequency interference (RFI). One outward difference is AudioQuest's use of its Dielectric Bias System (DBS), which consists of an insulated anode and uninsulated cathode inside each cable. These are connected to a battery pack at the cable's downstream end. The batteries keep the cable's dielectric constantly charged with DC, making the cable ready for play at any time -- no break-in required. Thus, both of these cable lines have similar goals, though they use different means -- and materials -- to achieve them. They also sound rather different. I described the WEL Signature cables as sounding "bigger and more bold," and I called attention to their "athletic sound that tracked each recording with laser-like precision." I wouldn't use such distinct terms to describe the sound of the Shunyata cables, nor would I call their performance "smaller and less bold." They are simply more self-effacing, less obvious in their way of conveying the music than the AudioQuest cables. When I listened to the Lucinda Williams and Linda Thompson recordings with the AudioQuest cables, for example, there was no less variation in their sound, but also a certain amount of increased edginess from the former and slightly greater delineation of performers in the latter. Does this mean that they are more resolving, for instance? Hard to say. I noted no lack of resolution with the Shunyata cables. Often in these comparisons I pick a product that I favor, but I can't do it here, even taking into account all of the equipment with which I've used both of them. While the AudioQuest and Shunyata cables don't sound alike, they certainly engender a similar reaction: that I'm hearing the music, and how the other equipment reproduces it, in a pure, direct way. I'll cop out and say that both are worthy of an audition. With the Aurora-IC and Aurora-SP, Caelin Gabriel has created interconnects and speaker cables that reach the sonic heights of his power cords. There is nothing these cables can't do and nothing they do to extreme, providing a clear, resolved and unforced view of the electronics, speakers and music, one that doesn't reach a tipping point or seemingly miss a sonic step. In fact, I'll coin a new word to describe them -- neutural, possessing both neutrality and naturalness. There's no denying that these are wildly expensive cables, and also no denying that they are at the very top of their respective product categories, even when far more expensive interconnects and speaker cables are considered. Reviewers' Choice without hesitation for the Aurora-IC and Aurora-SP. Welcome, Caelin, to the select group of multitalented audio craftsmen. Prices: Interconnects, $7500 USD per meter pair; speaker cables, $15,000 per eight-foot pair.